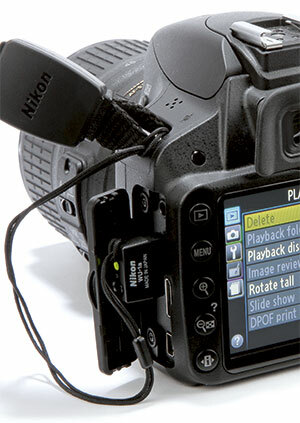 The Nikon D5200 does not feature built-in Wi-Fi, but is compatible with the WU-1a wireless mobile adapter. This device is tiny – roughly the size of a thumbnail – and attaches into the A/V out port on the side of the body. It is powered by the camera and connects it to a smart device via the (free) wireless mobile adapter utility app. It is compatible with smart devices operating on iOS 5.1 and Android OS 2.3 or later. Once the software is downloaded to the smartphone or tablet, it offers some useful functions. The main menu has four options: use the camera to take pictures; take pictures remotely; share pictures; and download pictures from the camera. Share pictures provides a direct link to social-networking sites for images already downloaded. Accessing pictures on the card to download them is a little slow, but once this is done then sharing is speedy. A minor niggle experienced on the Android smartphone used in this test is that the app does not ‘close’ when not in use – it remains active. Load a picture into Instagram, for example, and this same picture will come up for editing every time Instagram is started up again. Selecting the option to take pictures remotely turns the smart device into a remote live view, with control over the camera’s shutter, in line with the focus mode selected on the camera. Having recently used Canon’s EOS remote app with the EOS 6D (which does have built-in Wi-Fi), it is clear that the handling and functionality of Nikon’s app just cannot compete. The Nikon version lacks the speed of use and there is no control over the camera’s exposure. While the app is useful, there is plenty of room for improvement.